As wedding and event planning professionals, it is vital that we connect, collaborate, and learn alongside other designers and dreamers. Whether that means attending workshops and seminars, or getting inspired through creative events and exhibitions, we love seeing cutting-edge designs and keeping up with our industry inspirations! 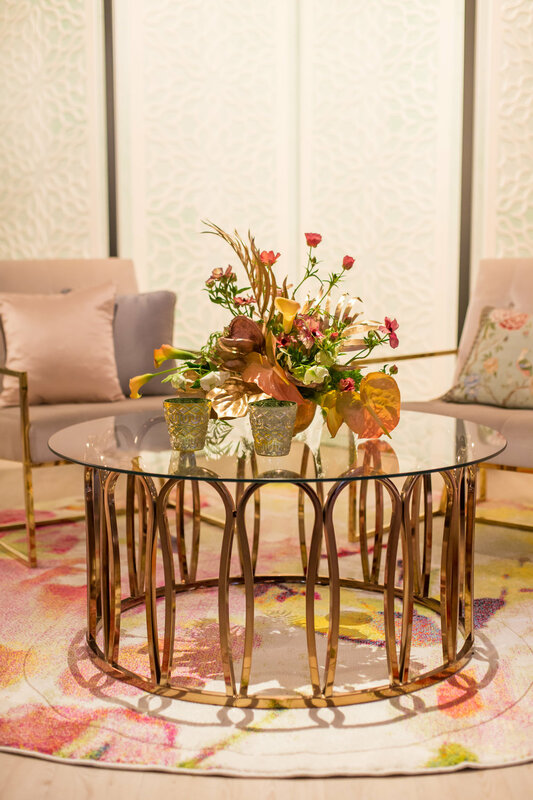 The Marilyn Ambra Party Consultants team recently attended the esteemed BluePrint Studios event, Spring into Design, where we perused all the creative tablescapes and stunning event set ups. We left so motivated by all that the open house had to offer, and we couldn’t wait to share all the Springtime trends with you! To see the Spring into Design highlights and take a peek at our favorite installments, keep scrolling! From the moment you walked through the signature blue tunnel and into BluePrint Studios’ bustling event, all the senses were entertained through lavish displays, delicious snacks, and ambient tunes that transformed the space. From elegant lounge exhibitions in bold shades of pink and purple, to earthy green table decor and rustic wooden details, the refreshing color palette of the event was rich in expression! Vibrant colors were on trend in every set-up we saw. Regal blue velvet couches were paired with deep purple and pink floral arrangements, which stood warm against the glistening gold-rimmed flatware that rounded out the table setting. Just next door, green and gold stole the show with chartreuse lounge pieces that complimented metallic throw pillows and tropical-colored floral fun. One display took a modern twist on kid-friendly fun by providing a Lego-inspired setting complete with an interactive “Doodle Booth,” and crisp white tables on which guests could play with the primary colored blocks. Made complete by a white background splashed with whimsical doodles, the kid-friendly corner was a hit for guests of every age.